Home surveillance systems have been around for a while now. Given that fact, it should be a pretty simple concept to understand, right? Well, many people are surprised to learn that there are actually three very different types of surveillance systems that you can install in your home. Yes, at their heart they all use cameras as a deterrent to crime. Some, though not all – which again is surprising – of the systems also record and store footage to be used as evidence if required. But that is really where the similarities end. We’re going to take a look at the three types of home surveillance system’s available and their pros and cons to help you to decide which one is right for you. Realistically speaking, this shouldn’t really count as one of the categories. Non-operational cameras are sometimes referred to as dummy cameras, but they are both nice ways of sugar-coating what they should really be called – fake cameras! A non-operating camera system is designed to look like the real thing, and it should also come with the kind of “CCTV in Operation” signs that a real camera will come with. However, you are relying on the fact that no potential criminal will be able to tell that the system is fake. It may as well fool 9 out of 10 possible intruders, but if that 1 in 10 does figure it out, the system is rendered useless. What’s more, if a burglar does figure out the system is fake – or even if they aren’t sure but they just don’t care – a fake system will of course not be recording any images, so it will not provide any evidence for the police to use. They are by far the cheapest option of the three – at least they’d better be – if you do opt for this option, make sure you don’t pay over the odds for them! The cameras themselves and the signs you install may – may – deter some would-be thieves & burglars. Installing a dummy CCTV system may give you a sense of security, but they don’t really provide it. The biggest con is probably that they just don’t work. If the worst happens and you are burgled or your car is stolen from the driveway, you will not be able to recover any evidence to help the police. Now we’re looking to invest a little more money in our home surveillance, so we’re looking at systems that actually work and record some images. Whilst this is a great start, of course, they may not provide the level of deterrence you assume they might – primarily because of the popularity of the non-operational cameras we discussed above. Those systems rely on potential burglars not being able to tell the difference between real and fake systems – ironically making the real systems less effective. Of course, compared to the non-operational systems, at least with a passive system you stand a chance of something being recorded. But that is also one of the weaknesses of this system, a clue to which is given in their name – passive. Systems that are passive simply record or allow you to view images in real-time. Their presence is a deterrent, that’s true, though as we’ve just discussed above, it may not be as big of a deterrent as many people think. So whilst they can be great at recording images to be used as evidence, wouldn’t it actually be better to prevent the crime in the first place? 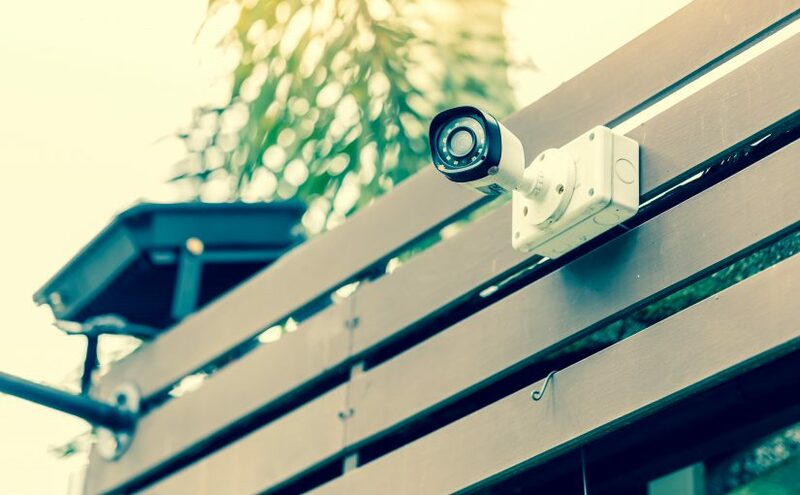 Very much in the middle ground when it comes to installation costs – they will cost less than the monitored CCTV systems we’ll discuss below, but are more expensive to install than the fake cameras. They actually work! So if a crime does occur, you should get some evidence that you can present to the police. … though they may not be as good a deterrent as you assume! They do not respond actively to crime, instead, they simply record. As we mentioned above, that can be great for evidence-gathering (see below), but are just – passive. Unless you happen to be looking at them just at the moment of a break-in, they will not stop your home from being burgled in the first place. Most criminals have now figured out these cameras exist, and so they do the obvious – cover their faces – meaning the evidence element disappear too. Can be complicated and expensive to install and service. We are now getting into what would very much be described as the premium end of the home surveillance system options. As we’ll discuss below, a premium product will naturally attract a higher price tag – though often this is not as much as you may think. But what is a remotely monitored CCTV system? Well, in a nutshell, we are talking about a system that does what the name implies – the cameras on the premises are being monitored from a remote location. The next big question is, what does “monitored” mean? The best way to think about it is comparing it to a monitored intruder alarm – i.e. an alert is raised when a sensor is activated by something or someone. That is to say, the CCTV cameras are NOT continuously transmuting images, rather this system involves the use of some sort of detection technology that triggers an actionable alert at the remote monitoring location. So, an alert is triggered when there is movement around the exterior of your home. When triggered, the CCTV cameras transmit images back to a control room, which allows the operator to see in real time what’s going on. If the control staff see a burglary about to happen, they challenge the intruder via the speakers installed at the property and connected to the system. More often that not, the intruder immediately flees the property before they get a chance to break in. The operators will then notify the homeowners and the police, to get an immediate on-the-ground response in place. This brings a level of real-time deterrence to the table that the two other camera systems above do not. Such systems are activated like a burglar alarm, i.e. only when armed, usually during the night or when you leave your home. Monitored means avoiding the cons of the passive cameras we mentioned above: instead of recording the crime, a real-time intervention takes place which actually prevents it from happening in the first place. In essence, the owner gets all the services of an all-seeing security guard, but for a fraction of the price. It doesn’t matter what the owner is doing or where they are, this service is always on, ready to act to prevent the break-in. It doesn’t matter if the intruder covers their face, the fact of the matter is that they will be off-site before any damage can be done. Can be complicated to install – though not more so than the passive type of camera we discussed above. These types of systems are the best, no doubt. But they don’t come cheap, and will require a monthly subscription payment. That being said, they are probably not as expensive as you assume, so it’s well worth contacting us for a quote or some further information. A lot of our customers pay the equivalent of the price of a takeaway coffee and newspaper per day – for a service superior to what a security guard could provide! Next Next post: Stronger Towns Fund: Do The Most Deprived Towns In The UK Have The Highest Crime Rates?